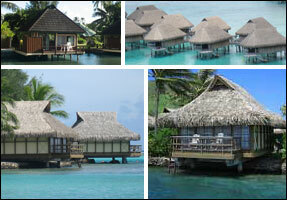 Extend your romantic experience by staying in an over-water bungalow for one or more days before or after the cruise. I prefer the pre-cruise stay because it gives you a chance to conquer jet lag before the cruise begins. You can book an over-water bungalow directly with the resort - or with your travel agent when you book your cruise. Usually, you can save money by purchasing your pre- or post-cruise over-water accommodations as part of the overall cruise package. My criteria are location, condition, service, food, entertainment, and watersports. It has 30 over-water bungalows, an attractive landscaped setting, a white sand beach, a large fresh-water pool, a choice of dining venues, and a marina offering a variety of watersports. As a bonus, you have instant access to the picturesque tropical scenery around Moorea Island. Click Paul Gauguin for its website.